Last week we decluttered, now this week we're going to go through and clean. Again, we will take the bins and trash bag with us, since it's been a week. However, the focus is cleaning this week. We'll be focusing on deep cleaning, but I'll also share my quick clean lists. Don't dwell on just 1 item, don't get sidetracked. We are not organizing this week, we'll do that next week. First, grab the cleaning supplies. This is the deep cleaning list that I do, feel free to modify it to suit your home. This keeps me on track and makes sure I don't miss anything. I only do a deep clean twice a year, usually I do the quick clean. Other steps in the deep clean area are done as needed. Put away everything and clear all countertops. Plug sinks and fill with 1" of hot soapy water. Fill a mug halfway with hot water and add 2 Tbsp Baking Soda, put in microwave on high for 2 minutes. Leave door closed for 10 minutes. Clean off all the items on the counters. Scrub down sink and faucet, drain. Go to microwave, open and wipe down. Clean stovetop and quick wipe out oven interior. Wipe down the pantry shelves. Wipe down exterior of fridge. 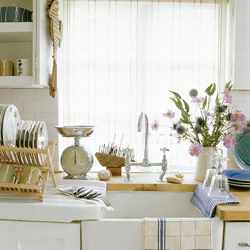 Put away clutter and dishes on counters. Wipe down items on counters. I like the cup idea for the microwave. I've always put the wet washcloth cloth in there and then wiped it down - kinda like a steam clean. The baking soda in with the water helps loosen anything that might be stuck on, but the concept is the same. It's a steam clean and I let the steam and baking soda do the work! Thanks Blaze! You should post some pics of your studio :) And yeah I can't wait to see the wedding details. I love weddings, stressful, but so beautiful and worth it.